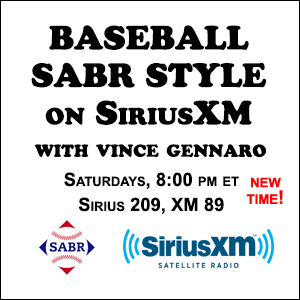 Behind the Numbers: Baseball SABR Style on SiriusXM, a radio show launched in 2015 and hosted by SABR President Vince Gennaro, is moving to Saturdays. Tune in at 8:00-9:00 p.m. ET on Saturdays and listen to the show on MLB Network Radio. You can watch video highlights of Behind the Numbers: Baseball SABR Style on SiriusXM on MLB.com and you can also listen to all recent episodes on-demand on the SiriusXM Internet Radio App. Behind the Numbers: Baseball SABR Style on SiriusXM focuses on examining and interpreting the statistical analysis that plays a critical role in baseball today. It airs weekly throughout the year on MLB Network Radio, available to subscribers nationwide on XM channel 89, Sirius channel 209, and on the SiriusXM Internet Radio App. For more information, click here. This page was last updated April 12, 2019 at 1:41 am MST.